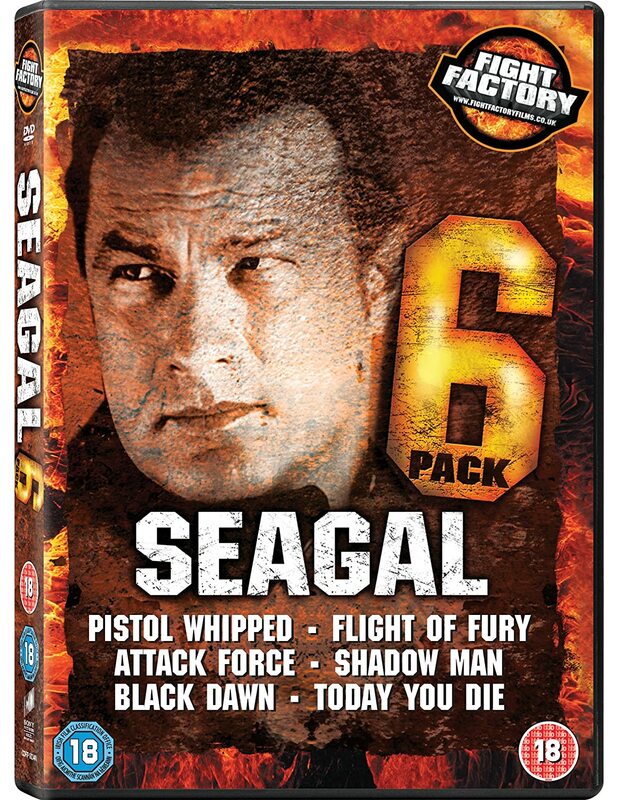 Overview Steven Seagal (Shadow Man, Black Dawn) is back in this high-octane, action thriller! When Marshall L Lawson (Seagal) loses his strike-team in a cold-blooded and seemingly random attack, he takes it upon himself to investigate the suspicious circumstances of the brutal killings. Resolute in his pursuit, Marshall engages in merciless battle with a drug dealer operation that appears to be secretly funded by a rogue arm of the military. My thoughts This is a weird movie! It is especially weird if you don't know why this movie looks the way it does. Originally this was filmed as a sci-fi/horror story called “Harvester”. It featured human-looking aliens whose only tell was that they had eyelids that closed horisontally, making them look really weird when they blinked. Apparently the producers got cold feet when they saw the finished result and decided that the only way the film would recouperate its cost was if they changed it into a standard Seagal action movie. So – without the participation of the original director, the author or the star – they shot some additional scenes, re-edited the movie and redubbed much of the dialog. One of the problems with this was that the actor they hired to redub some of Seagal's dialog does not sound anything like Seagal. So the result is that some scenes have Seagal's own voice and some scenes have him speaking in a totally different voice, making this a truly bizarre experience. And the aliens are now humans, addicts of some new and dangerous drug, but the still blink the wrong way around. It's a little like Plan 9 From Outer Space where Bela Lugosi is replaced by Ed Wood's wife's chiropractor holding a cape in front of his face. And the storyline in this movie makes even less sense than the one in Plan 9. Well, we all have our guilty pleasures, don't we? Another one of mine, well I don't know if it is exactly a guilty pleasure but I am terribly fond of fifties horror movies of the drive-in kind. I think it's because I used to read about them in Famous Monsters, but very few of them found their way over here (or I missed them because I was too young). So I was kept curious about them for many years until they started to show up on home video. First on VHS, of course, but eventually on DVD. So now I have lots of those - and loving it. Overview Two cinematic legends, John Wayne and Kirk Douglas, team up to seize a small fortune in gold in this action-packed western classic. 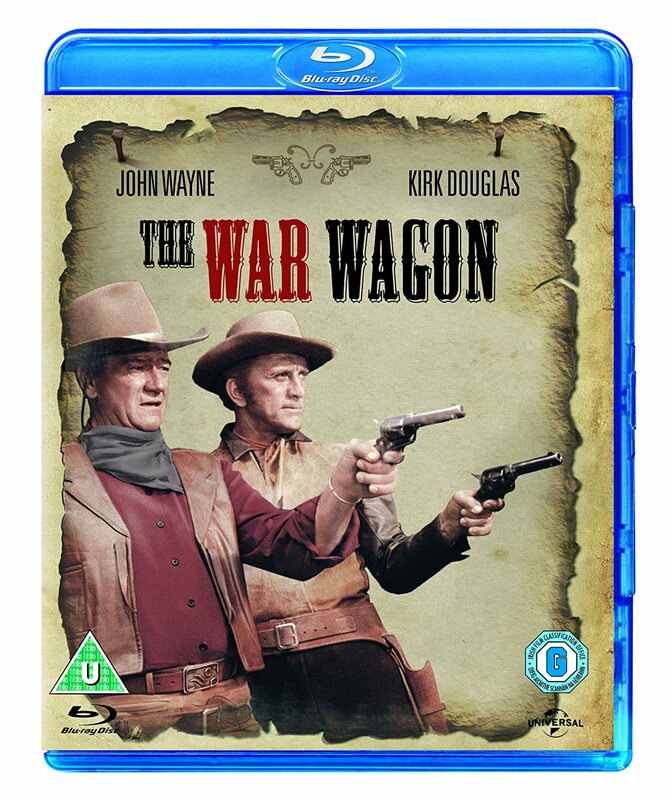 Wayne plays Taw Jackson, a range-hardened rancher who's hell-bent on capturing the infamous War Wagon, an ironclad stagecoach protected by a small army of men and owned by a thieving cattle baron who robbed Taw of his gold and good name years before. To get even, Jackson recruits Lomax (Douglas), a brash gunslinger, and a raucous crew of misfits and readies them to pull off one of the most impossible heists of all time. My thoughts I must admit that The War Wagon surprised me a bit, because I had a mental picture of it being an older black-and-white movie. I don't know why. I may have seen a b&w photo from it a long time ago, or perhaps a clip or a trailer on b&w TV back in the late sixties. Anyway, seeing that it was in widescreen and color was a pleasant surprise. John Wayne and Kirk Douglas has great chemistry in this film. Howard Keel as an indian? Awkward casting is you ask me. Bruce Cabot makes a good villain, and Keenan Wynn is believable as a greedy old codger. Bruce Dern has a small role, too. Director Burt Kennedy was good at making these kind of westerns that don't take themselves too seriously. And he does a good job here, too. There are some really well done matte paintings by Albert Whitlock, but if you watch closely when the bridge is blown up the registration is not perfect and it becomes evident that the bottom part with the chasm is a matte painting. A fun western, and it looks and sounds really good on this region free UK release. Highly recommended. I really like this movie and did a review earlier of a non-Blu version of this movie. I may have to look for a copy of this Blu version here in the U.S.
yep it was a great film when it came out and if you are someone who analyzes it will show some wear on the edges. But if you simply immerse yourself in the film ... I enjoy it every time I watch it. Like Gunfight at the OK Coral. My thoughts This is the slasher version of The Phantom. It deviates from the book in several ways, in names, in locations and in story details. There is a somewhat confusing frame story that is set in present day New York, but the main story is set in London rather than in Paris. As for the mask, it seems to be a mix of inspirations from Texas Chainsaw Massacre and House of Wax (1953). Disappointingly missing from the story is the falling chandelier. Apparently the producer couldn't afford it. Robert Englund is good as the Phantom, but a little too creepy for my taste. Jill Schoelen as Christine is nice to look at, but not very memorable. 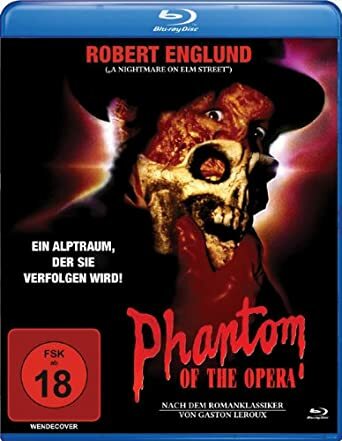 To me, this looks more like a slasher story than a regular telling of the Phantom. Your appreciation of it is most likely dependant on how much you like slasher films. Me, not so much. Personally I have a soft spot for the Hammer version with Herbert Lom. And, of course, the silent classic with Lon Chaney and Mary Philbin. So for me, this one is OK, but not more than that. 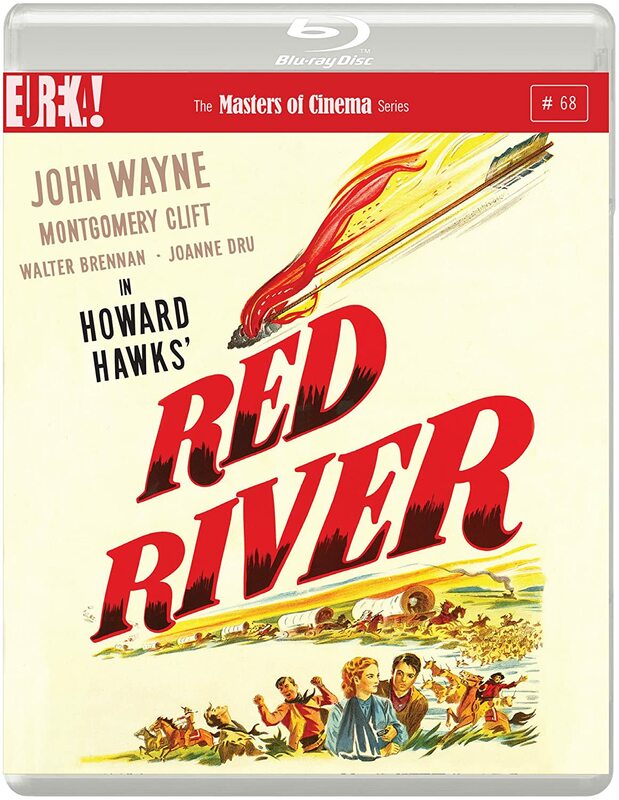 Overview One of Hollywood's most iconic westerns, Howard Hawks's Red River launches cinema's grandest cattle drive, and one of the screen's most powerful father-son dramas. One of John Wayne's most intense roles inspired one of his finest performances, and in his debut leading role, Montgomery Clift instantly leapt to the forefront of Hollywood's young actors. After the Civil War, ranch owner Thomas Dunson (Wayne) leads a drive of ten thousand cattle out of an impoverished Texas to the richer markets of Missouri, alongside his adopted son Matthew Garth (Clift) and a team of ranch hands. As the conditions worsen, and Dunson's control over his cattlemen gets ever more merciless, a rebellion begins to grow within the travelling party. Filmed among glorious expanses with no expense spared, and a roster of brilliant turns from greats including Joanne Dru, Walter Brennan, Harry Carey, John Ireland, and Hank Worden, Red River is an all-American epic, a grand adventure yarn, and a profound psychological journey. The Masters of Cinema Series is proud to present its first UK release on Blu-ray. My thoughts Another John Wayne western. But quite unlike The War Wagon. Red River is no comedy. Well, possibly with the exception of Walter Brennan's part. I have to think that the screenwriters for Rio Bravo had seen Brennan in Red River and wrote the part of Stumpy just for Brennan. Anyway, John Wayne's character Dunson is one of the meaner parts that I have seen Wayne play. Montgomery Clift is very good in one of his first film appearances. The supporting cast is very good, too. Coleen Gray gets fifth billing, and yet is only in the movie for a few minutes at the start. Since the film was shot in 1946, this is her first credited role. She is quite good, but you have to wonder if her role was initially bigger than what ended up on the screen. The film offers great drama, and the scenes with the cattle drive are impressive. That's a whole lot of cows. The biggest disappointment – for me at least – is the feel-good ending that just seems so at odds with the characters. It felt like the screenwriters had painted themselves into a corner that they couldn't really write themselves out of. But in spite of the ending, this is a really good film. If a film is well over two hours long and I never feel that it's dragging, then the director is doing something right. Highly recommended. So David, what didn't you agree with? My view on the ending? And yes, I like westerns. And John Wayne. One of my favorite films groving up was The Alamo. Rewatching it today I don't quite see what it was that fascinated me so much. It's an interesting piece of history, but not really a great film. I would like to see the roadshow version restored, though. When I watch the DVD it always feels butchered. The full version is the one I saw on my 14th birthday (and a few more times that year) and although I might not feel that it's a great movie, it still has a place in my heart. Seems it's too late to rescue the removed scenes, though. That's a shame. Yeah the ending, which i thought was good (though of course predictable) and Walter Brennen. Though somewhat 'comedic' i thought it was a more straight role than say in Rio Bravo. But I thought 4 was a very good score, 4+ would have been pushing it .. but Cliff Montgomery's performance probably deserved it. Ok, I guess we'll have to agree to disagree about the ending. As far as Walter Brennan is concerned, I do agree that he's more restrained in Red River. That's why I wrote "possibly". It just seemed to me that someone, perhaps Hawks, liked his bantering with Wayne and thought it would be fun to turn it up a notch or two in Rio Bravo. Overview It's the first comet to buzz the planet in 65 million years, and everyone seems to be celebrating its imminent arrival. Everyone, that is, except Regina Belmont (Catherine Mary Stewart, The Last Starfighter) and her younger sister Samantha (Kelli Maroney, Chopping Mall), two Valley Girls who care more about fashion trends than the celestial phenomenon. But upon daybreak, when the girls discover that they're the only residents of Los Angeles whom the comet hasn't vaporized or turned into a zombie, they do what all good Valley Girls do...they go shopping! But when their day of malling threatens to become a day of mauling, these gals flee with killer zombies and blood-seeking scientists in hot pursuit! My thoughts This is a fun little movie from the eighties that shows inspirations from Valley Girls combined with Target: Earth and a healthy dose of I Am Legend. Unlike most ”last people on earth” movies this one is tongue-in-cheek, although played straight. Another twist is that the main characters are female, two sisters. Being a low budget movie, it doesn't have much in the way of effects, other than some pretty effective zombie makeups. But the empty streets of Los Angeles are creepy enough. I first saw this when I rented it on VHS about 25 years ago. I like it then, and I still like it. It's no masterpiece, but it's good entertainment. The blu-ray looks as good as you could expect from a low budget eighties film. 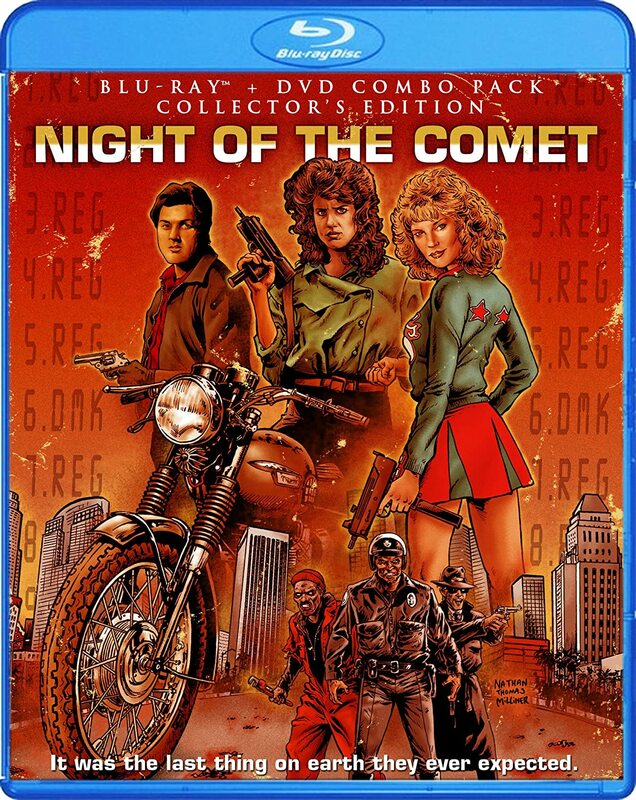 It has three moderately interesting featurettes, one featuring the female stars, Kelli Maroney and Catherine Mary Stewart, one featuring Robert Beltran, and one featuring makeup supervisor David B. Miller. It also has three (!) commentary tracks. One with Stewart and Maroney, one with director Thom Eberhardt, and one with production designer John Muto. I sampled a bit of them, and they all seem interesting, but I don't have the stamina to watch the film three more times right now. I'd have to be paid to do that, now matter how good a film is. In conclusion, a movie that provides an hour and a half of good entertainment. Recommended!